ENVIRONMENTALISTS FOR NUCLEAR™ is in favor of all energies which respect the environment, including the peaceful applications of clean nuclear energy (which has the greatest industrial potential), as well as renewable energies (hydro, solar, geothermal, and wind, all have appropriate roles to play, but with a much smaller potential). "Nuclear is the coolest of all"
"Nuclear is about a million times better than coal or natural gas"
"Per MWh, nuclear is the minimizer"
it will open the way to a new paradise". 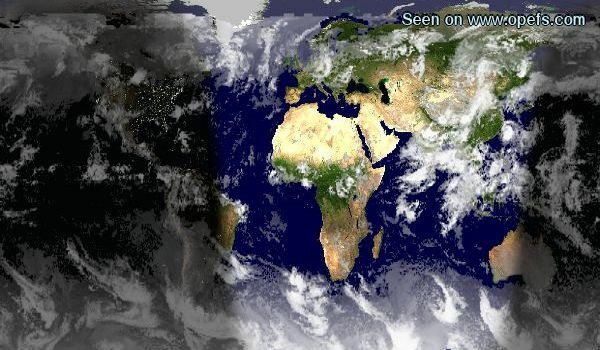 Our beautiful planet such as seen from outer space right now (including the lit and shaded areas, clouds...).